Heromorph - Forum - HM General Chit Chat - Are Minor Characters/Ideas Free to Grab? Are Minor Characters/Ideas Free to Grab? Apparently in the last couple days a discussion about creative property copyright broke out between Michael Netzer and Neal Adams. By that line of thought, lets say someone here at Heromorph publish some original character/design/idea that someone at DC or Marvel or any other comics, game or movie company finds interesting enough and decides to use it as its own creation. Re: Are Minor Characters/Ideas Free to Grab? Oh HECK no! If they want to use Oni, then they will need to contact me for permission, present a legal contract that I would approve first and foremost. Then there would be a matter of payment for a "Renters" fee so to speak that would state I would still retain ALL rights to my character. 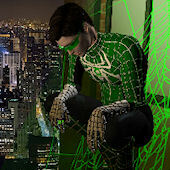 I would also keep digital and hard copies proof that this is and was my character well before they got wind of him. Oh man! 1st off, let me say, great forum post, Ozzy!! This was a real jaw dropper when I first heard this news! BTW, I can't get the Bleeding Cool News Adams response to come up so I'm not sure what he had to say on the matter but I am disheartened by this news and I don't think Netzer's complaints are unfounded. This is a very complex issue though. Apparently, Netzer had written a very forgiving and thoughtul response to Adams on the matter a year earlier but apparently he's had a little time to rethink it. Sure, it makes Netzer look a bit more hypocritical but I think that Netzer's career in comics is considerably less landmarked than Neal Adams so I'm sure it really gets Netzer's goat much more as he dwells on the way Neal hijacked his character. Part of Neal Adams' legend is how he championed creator rights and this stains that history a bit. It's all very sad to me. Now me, ...I believe that ego is the devil in all of us that warps our perception to make ourselves look like the hero in spite of all that f**ked up sh*t we do. I think it's going on with Neal and Mike. Neal should publicly apologize for stealing Mike Netzer's character without permission. Period! But Mike should realize that Ms Mystic is nothing more than the most menial footnote in the history of comic book characters because neither he nor Neal bothered to develop her enough to make her very memoriable to anyone. (BTW, I say this as someone who bought those original issues!) Yet neither man appears capable of seeing beyond their own perspective. Now, ..."In the opinion of this people, as I understand it, it is OK to steal/borrow someone else idea/character IF its not a big one or well know... "? Well, in the opinion of THIS person, that's not so easy to define as simply "yes" or "no". Legally speaking, yes, it is okay to steal someone else's idea if it resides in the public domain. BUT that does not automatically assume the creator has given his/her permission so whether it's right or wrong depends on your value system. Of course, it's ALWAYS wrong when someone steals YOUR work! but what about when YOU use others characters? Most of us here use others' characters ALL THE TIME!! Not JUST public domain...AND we use others creations (like 3D models and sets, photos, even their art) ALL THE TIME TOO! Let me not even get into how often folks doing "original" work are "borrowing" concepts and ideas from others! So me, I'm okay with borrowing or stealing... up to a point. I agree with Netzer on his position: if someone steals your creation, claims it entirely as their own, and publishes and profits from your creation, it's flat out wrong! But if anyone wants to pay me a commission for a fan art illustration or render of a DC or Marvel character, I'm totally cool with that! As to my own original characters, my present view is largely that I would allow others to use them IF they asked permission from me AND credited me for their usage of my creations (and perhaps credited the original work from which they appeared) BUT I firmly maintain my right to change my mind on these permissions so ask first, kiddies! Neal's Answer from Bleeding Cool, if you're curious but there is already a follow up article to that one. 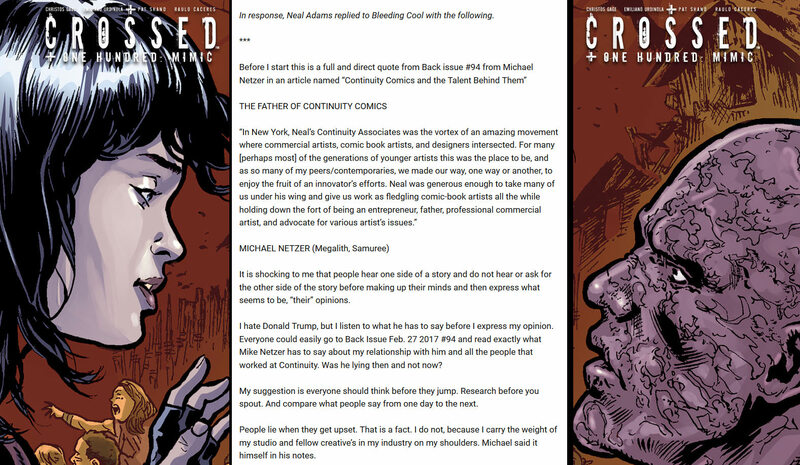 In response, Neal Adams replied to Bleeding Cool with the following. It is shocking to me that people hear one side of a story and do not hear or ask for the other side of the story before making up their minds and then express what seems to be, “their” opinions. I hate Donald Trump, but I listen to what he has to say before I express my opinion. Everyone could easily go to Back Issue Feb. 27 2017 #94 and read exactly what Mike Netzer has to say about my relationship with him and all the people that worked at Continuity. Was he lying then and not now? My suggestion is everyone should think before they jump. Research before you spout. And compare what people say from one day to the next. People lie when they get upset. That is a fact. I do not, because I carry the weight of my studio and fellow creative’s in my industry on my shoulders. Michael said it himself in his notes. He can say what he wants because he has nothing to lose and he tells you that I have. That is why I never lie and I treat everyone as an equal up to the point that they betray people around them. I am sorry that people had to read these lies and I hope you can turn it into a life lesson, not to react till you know the whole story. And then posted, a line-by-line rebuttal. I have answered this before and I will answer it again,…because when someone lies about one, unfairly or in a nutty way on a Public Forum, you must answer for the sake of the people who care! So, here! When I was asked by Pacific Comics for an original creator-owned series, My first choice of those several characters was Ms Mystic. Since I always try to advance the work of other younger creators, I asked the young Mike Nasser if he’d like to join me in this project? He said yes. This is what I proposed. Since I created Ms Mystic, inspired by Eve Jones (From “The Heart of Juliet Jones” )by Stan Drake. One of my Heroes. And Black Canary, that I had done for D.C. I would write and rough out the story and script. Mike would pencil the book and if he completed 12 issues, for the first year of monthly books, I would share the creator profits, (if any.) He agreed. 2. Ms Mystic was never offered to D.C. Comics EVER by me! How could I possibly propose Ms Mystic to D.C. if I was going to publish it myself? It was MY independent project. Behind my back, never saying a word, Michael took Ms Mystic over to D.C. Comics and offered it for sale…. and as if it couldn’t get worse… Michael billed D.C. for the pages he had half finished…. and just as incredibly D.C PAID HIM FOR THE PAGES…. AT MY RATE!…. convinced that I was fully participating! Why didn’t D.C. ever call me or contact me????? I will never know! Actually, I was on a one-man strike against D.C. at the time. So I just don’t get it. When I got wind of these shenanigans I contacted Jeanette Kahn and Paul Levitz and told them “No, I never authorized such an offer or sale. Mike was acting very strange at this time,..and so D.C.s people understood! In FACT D.C. sent the pages back to me, with the D.C. stamp on the backs.….and NEVER asked Michael for their money back! Since I also paid Mike for the work,..he was paid twice for the same work! 4. Only a few pages were completely penciled. Michael had the script for a YEAR! And gave excuse after excuse for not finishing the pages Or the story!. In the end I had to re-pencil the pages and finish the story! I kept as much of Mikes work as I could,…but Michael was acting very strangely and in the final months of that year did NO WORK on the book! Then I learned the terrible truth! The character looked exactly like Ms Mystic,..super long hair and all! Of course others in the studio let me know what was going on! I had no choice. I took Michael off Ms Mystic, told him the deal was off, and took over the task of doing the pencils myself and finishing the book. I also told him I expected him to remove the super-long hair from starchilde and I wouldn’t make an issue of his insult. I was very worried about Mike by this time, since he was drawing himself as a kind of Messiah,.and included my daughter Kris in his drawings. 5. That “new Pursuit”??? Well, as folks who know will tell you,..that pursuit was the most troubling of all,, and because of Michael’s family I choose not to speak of it,…but it was profoundly problematical! 6. Landings? Michael,.should tell the people what he was doing all this time and where he was sleeping at night and if and when he worked. He should tell about the phone calls from the police calling me to vouch for and identify him. Tell the people who he thought he was! 7. I TRIED to get Mike to straighten out! Ms Mystic was DONE! I was trying to save Mike. We all were. 8. Nope! NEVER finished the first book of pencils! 11. Mike’s presence was NONEXISTENT! Had Mike not disappeared. I would have helped him as best I could as I have done for many others. Most of the rest of this is the rantings of what Michael has become… but I will respond. 12. No,…. I re-penciled and then inked! (Since the original layouts were mine for Mike to work from. 13. True. Mike was a true mess! My choice! And it remains my choice! 16. Mike here blames me for his going to Israel. GOOD, I’ll take that one. Moving to Israel was the best thing for Michael. He seemed to straighten his life out and gain some values. It was a relief for all. 18. The rate was correct for the time… and I never mentioned he’d already been paid by D.C.
19. Mike promised he had “changed” and would “prove it to me.” If I gave him another chance. Against all advice I let him come back… If I could “see” the change. 20, 21, 22, 23, 24. And so the , old man Mike rears his head with lies! How does one fight flies? FACTS! Let me explain further. The “Old Mike” when he began in the studio,… he and I played practical jokes on each other all the time. Mike once traced one of my pages and then with other paper ripped it up and strew it all over my work area, I in turn hid his chair in the outside bathroom,… he would in turn play another gag on me,… and sometimes this would go on for days. THIS was the old-new Mike Nasser. 28. Yep. True? And, truly I again became concerned. 29. Nope. No heart attack. The judge had many more reasons. Many! In some way, I wish some spark of Michael’s story was true,… So I might have some reason to reach out to him and relieve his self created burden and self pity! I want to,… but I cannot. Mike has betrayed me time after time, as he has others and lied to get into my studio in many ways. He and I have had some few good times and many bad times . He has oppressed my family (5 adult kids, now) along the way and no matter how he may cry at my door, and he has. I will never let him NEAR me and mine! What we do, and a LOT of profissional artist do too, when taking comission work with some known character is not the same thing. We (and any artist I see posting comissioned works) NEVER CLAIM that said character to be ours. Of course, I'm not including here the 3D stuff you're mention or even when someone (you know who you are) uses parts of others works to make new images without giving credit. My point here was and is asking what if someone steals your Original character and publish it with new original stories as their own creation. This right here IS THE RIGHT THING TO DO, if said character to be used in a non-commercial way, in my opinion. Of course, IF the case is to be used by a publisher and such, I totally agree with DW. After all, business is business. What we do, and a LOT of professional artist do too, when taking commission work with some known character is not the same thing. We (and any artist I see posting commissioned works) NEVER CLAIM that said character to be ours. Wait, I thought you said stealing OR BORROWING when you asked your question. Is there a misunderstanding between us as to how we define these terms? I mention this because your reply seems to indicate you are now ONLY addressing the stealing part in how you have taken my comments into consideration and stealing and borrowing can be two very different things at times (yet very similar at other times). What we and professional artists do when taking commissions of characters created by others is ABSOLUTELY borrowing in my view! Clearly, you should not outright steal someone else's work. Is anyone disputing that? One of the points I'm trying to make is this is not always so simple as yes or no. These lines get blurred very easily. Plenty of my favorite comic artists have "swiped" the work of other artists when drawing their stories. Sometimes borrowing can be the first step to stealing. Look at Marvel's Daredevil. They borrowed the name from a golden age character in the public domain. Okay, that's fair usage. BUT now Marvel has staked a legal claim on the name so that if you decide to use that golden age Daredevil, you can not call him Daredevil. I am of the opinion that if you borrow something from someone and then refuse to give it back and claim it entirely as your own, it's STEALING! But all that cash fed to the courts makes Marvel legally correct. ...and sometimes stealing become borrowing. Let's take a look at Ralph Bakshi's Wizards. I loved that film when I first saw it. I still think it has much merit but it's quite tainted to me. You see Bakshi had been working with underground comix legend Vaughn Bode to bring Bode's Cheech Wizard, Cobalt 99 and his other characters into a big screen adaptation in much the same way as he'd done with Crumb's Fritz the Cat but when Bode died unexpectedly, Bakshi just made the most modest of changes to the characters and story while removing all credit to Bode and keeping it all for himself. To me, this crossed well over the borrow line into outright theft though Bakshi claims borrowing. What about the case of MarvelMan (later renamed MiracleMan for fears over a certain lawsuit happy company with Marvel in their name )? Now this one's got layers! So Alan Moore decides to revive what he thinks is a public domain character and brilliantly revives the obscure MarvelMan. Turn out to be hugely successful which becomes a problem because this all but forgotten character is still owned by it's creator, Mick Anglo. Now Moore does the right thing and pays him his royalties for the usage but Anglo's original character ain't so original at all. In fact, as he'd originally written it, it's a very thinly veiled rip-off of Fawcett's Captain Marvel, right down to character personalities, story type and artwork. So does Anglo really deserve royalties? It's only Moore's treatment of the characters that adds any originality to it. Where does this land on that territory of borrowing/stealing? But wait... it's stolen from Captain Marvel, a character sued out of existence by DC Comics because DC claimed it was a rip off of Superman. Of course, DC used the opportunity to acquire the character on the cheap and then proclaim he he wasn't a rip-off of Superman! So which parts can be defined as original and which as rip-off by the time we get to Moore's MiracleMan? So you say "business is business". It's not that simple for me. Look at the business models I've shown. Now let me show how business works: I like DW's Oni character but since he's clinging so tightly to it, I just create my own similar character. When asked, I just say "Nooo, nothing to do with his character, I was inspired by DC's Claw and Moorcock's Elric!" SO that's cool, right? I mean business is business? Not to me. Business gets it wrong a lot and can gunk up the works. DID YOU KNOW that DC and Marvel have a joint copyright on the word "Superhero" and have shut down others when using the term in their comics?! So in closing, OF COURSE, you should never outright steal some else's work (regardless if the law approves). For me, that line where you've taken someone else's ideas and crafted them into something that is entirely yours to own is some tricky territory to navigate and I can't lay down any hard and fast rules when judging but rather need to consider them on a case by case basis. My bad, wrong choice of words on my first post. I meant to use the BORROW part as sarcastic, not a very happy way to present it on my part. Fortunatly, I can blame on english not my native language. On a more serious note, I really see your point and agree with it. And yes, things are not always that simple, specially if big names (either authors or companies) are involved. All said and done, the fact also remains that almost everything has been imaginated and re-imaginated at one point in time and its bound to happen that some new author will come up with something similar to something already been done before.